Today, we have the pleasure of presenting a guest post from Mico Tatalovic, who wrote in October aboutretractions in journals in his home country, Croatia. Here, he describes what appears to be an alarming rate of plagiarism in Serbian journals. A report for the Serbian science ministry by the Centre for Evaluation in Education and Science (CEON) found that whopping 11% of scientific journal articles by Serbian authors published in English language but in Serbian journals were plagiarised. The proportion was similar across all sciences (natural, medical, technical and social). Apart from widespread plagiarism, they also found that 0.35% of the articles in the the Serbian citation index and journal database (SCIndeks) were published twice in identical form, often in the same journal. Forgetful editors who still track manuscripts ‘manually’ may forget to mark them as ‘published’, which can result in duplicates in the same journal, according to Pero Sipka, director of CEON. Interestingly, editors and publishers were less likely to deem a paper plagiarised than were outside analysts, according to the report, and not all editors and publishers openly cooperated. Given the shocking amount of plagiarism you might also expect to see a flurry of retractions, but it’s not so. In fact, a search for ‘retractions’ (in both Serbian and English) on SCIndeks brings up only 6 retractions, and this is from more than 123,000 articles published since 2000 (since 1991 for social sciences journals) in some 445 journals listed there. Four out of the six retracted articles are still fully available from the database or the journal’s website with no indication that they had been retracted. One of them has been deleted entirely, both from the journal’s website and the database – and if it wasn’t for the gap in page numbers where it once sat, would have left no trace. Also, all have been retracted by the editors for self-plagiarisms or plagiarism, with no apparent efforts to get a reaction from the authors. None of the retraction notices quote the author of plagiarised article. One of them, Vuk Mijailovic, says he only heard about the retraction of his paper from a friend who works in the Military Medical Academy (VMA), the institution that publishes the journal that retracted his paper.. The mistake was caused by my inexperience. I sent the article for a presentation at a Serbian congress of emergency medicine, but instead of sending just the abstract I had sent the whole text. Following this, my paper got published without my knowledge in the ABC Journal of Emergency Medicine, and, not knowing this, I sent it for a review at Vojnosanitetski pregled journal. The situation ended up pretty stupid and unpleasant, and it’s a consequence of me not knowing that congresses need only abstract, not whole texts. Lack of information is not an excuse here: There are more than a dozen articles on SCIndeks dealing with plagiarism and authorship issues, including a 2002 article on how to retract. 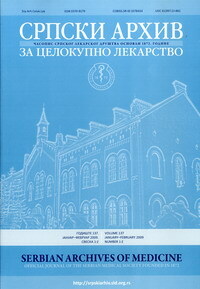 The retraction notices appeared twice in Srpski arhiv za celokupno lekarstvo (Serbian Archives of Medicine), both in 2010, and then one each in Stomatološki glasnik Srbije (Serbian Dental Journal), in 2010, Computer Science and Information Systems in 2010, Vojnosanitetski pregled, in 2009, Ekonomski anali (Economic Annals), in 2006. Both of the retractions in Serbian Archives of Medicine were decided upon at a same meeting of the editorial board, which decided to retract the articles because they had been published “in almost identical form” in other journals. One was a 2004 article “St Luke and his Cult as holy healer of the Serbs,” which was published in 2003 in Arhiv za farmaciju (with the same title). The retracted article is still fully available through the database with no indication of retraction. The other paper is 2008’s “Recombinant activated facto VII and intraoperative use of cell saver in treatment of arteriovenal malformation,” which was published, again, with almost the exact same title, in Vojnosanitetski pregled in 2007. Although the supplement where this appeared is not available through SCIndeks, the paper is fully available from the journal’s website, with no indication of retraction. retracted, that is annulled, and does not appear in the database of this journal [anymore]. Through this its further citation in the author’s bibliographies is being disabled and its further citation prevented. which is against the principles of good scientific practice and ethical codes of scientific research. In fact, this article is still fully available from the ScCIndeks database , as well as the journal’s website, with no indication of retraction. means that no citations of listings in literature of bibliographies are allowed, and accordingly the editorial office retracted the text from the journal’s website and it has taken steps to remove it from other relevant Internet sites. The notice also apologises to the scientific public and readers, as well as the authors of the original text – although it never says where and when that was published. This article is indeed fully deleted from the database and the journal’s website. And the article in Vojnosanitetski pregled says a majority of the 2008 article ‘Prognostic significance of acute bundle branch block in patients with acute myocardial infarction’ overlapped with one previously published in 2007 in ABC – časopis urgentne medicine (Emergency Medicine Journal). Once again, the retracted article is still fully available at the database with no indication of retraction, as well as from the journal’s website. Computer Science and Information Systems‘s editors said in a retraction notice that ‘Blind Separation Using Second Order Statistics for Non-stationary Signals’ published in 2010 “is a confirmed plagiarism of the original work”, masters thesis from 2007, and apologised to the original authors. They dealt with the retracted article in an interesting way: the title and the list of authors and their affiliations are still on their website, but below it is the retraction notice followed by instructions to download the original article that was plagiarised. But, this has not been updated in the national database, which still lists the full article with no indication it has been retracted. None of the retracted articles has been cited yet, according to the SCIndeks database. In response to the CEON report, the Serbian science ministry is updating its rules on evaluating scientific work to include a section on plagiarism, according to the Danas newspaper. I bet that other coutries are the same. Geroge Bernard Shaw said that the professions were a conspiracy the common man a century ago. What changed in that time? Now many find the phrase “common man” sexist,even though it refers to mankind, so we would now have to write that “the professions are a conspiracy against the common man and woman”. Given Balkan sensitivities, a Croat writing negatively about Serbian science is probably not the best of ideas. But at least 2012 does not kick off with a retraction due to yet another Photoshopped western blot (they are so 2011). As an editor of documents written by a wide range of researchers (seasoned, inexperienced, Western, non-Western), I find that many researchers simply don’t know what plagiarism is. They find it difficult to distinguish between acknowledging other researchers’ ideas and copying those ideas. They haven’t learned strategies for making this distinction. Moreover, although they may understand direct quotation, their understanding of indirect quotation is poor. Finally–and here many others of us may stumble–they can’t answer these questions: What is an original idea? For an idea to be considered “original”, must it be new in every one of its aspects, or may only a few or several new aspects suffice? Researchers learn to navigate these waters through inquiry (in laboratory, fieldwork, or other practical endeavors), reading the works of seasoned researchers, writing, giving criticism, and receiving criticism. A great deal of experience, from several perspectives, is required. Cumulative experience produces trustworthy intuition. We need this, because in many situations we can’t know for sure (brain) when we’re going astray. We must feel it (gut). Situation in Brazil is the same. A number of papers by the Brazilian authors known to this very blog Airioldi and Gomes and Zuben were challenged among Brazilian periodicals and institutions, but nothing whatsoever was done in response. Only the most serious sources have punished these types. This tells a lot about reliability of science discoveries by the 3rd world (i.e. emerging) countries. I totally agree with Janet Byron Anderson PhD. Many researchers, specially those in developing countries, are not aware of what constitute plagiarism. There is a need for training scientists in research ethics and best practices in research. How many of us researchers have taken ethics courses? Sorry, yet I work in a developing country and all I see is that the old excuse that “I did not know this was wrong” is being used way too often for basically every thing that comes up. Plagiarism is older than science. No scientist should be allowed to claim that he never knew copying his fellows was wrong. Periodicals and even newspapers nowadays are packed up with editorials on publication ethics. Problem is, the very tutors and sponsors in the developing countries made to their present prestigious positions based on copying colleagues and manipulating their data. Punishing the lot would bring the debate to their own publications. They are not naive, my colleagues and friends. But they now must fake. That is globalisation in action. I agree with many posting here. I’ve seen my share of hushed accusations and wrongs swept under the rug at Korean universities, possibly because “Punishing the lot would bring the debate to their own publications”. I have no idea whether any of them are major enough to write about here, because everything is handled in-house among senior professors. I’m not saying US and Europe are immune, but they are better prepared to handle conflicts of interest and wrongs committed by the researchers. As for educating students? US students are better taught about plagiarism and citing than Korean students, I can attest to that. I for one, suspect that the idea of giving another his or her due for an original idea is a concept foreign to Korean culture. I know it’s irrelevant here, but I’m not surprised one bit by lawsuits between Samsung and Apple. “Samsung slavishly copying Apple’s design”… It is on some level corporate mudslinging, but the cause is more deeply rooted than that I suspect. I’m looking forward to some serious analyses on what goes on in China. From my experience as a reviewer for many journals, things do not seem to be going so well there and I wonder how much fraud there is. The real threat to the scientific enterprise is NOT plagiarism, it’s data fabrication and manipulation. If resources had to be split between fighting plagiarism and data fabrication/manipulation, the proportion should be probably something like 1% and 99%, respectively, in my opinion. Plagiarism does not derail science, it may even do some good if additional readers (who read the journal in which the plagiarized article is published) are exposed to theories/ideas that they may otherwise missed. In contrast, data fabrication and manipulation do derail science and create long-term damage. I agree. I actually think that plagiarism is less serious than some practices which are not currently considered misconduct, such as only publishing “good” data. But plagiarism is still wrong & ought to be dealt with, the good thing is that it’s the easiest kind of misconduct to catch. I reckon within a few years, when plagiarism detection software gets into widespread use, it will stop being a problem. Totally agree with both of you. It is very easy and confourt to keep catching the silly plagiarists and feeling swell on that, while the smarter fraudsters keep getting away and so deeply jeopardize Science as a whole. Literary word-to-word plagiarism should be banned by faster (OSX/Lynux-based) comparison of submitted manuscripts (in serious periodicals). However exposing big fraud still demands a lot of investigation and nuts. In this case I think the multiplication of transparent blogs like The Abnormal Science Blog and integrative discussion among scientists from different backgrounds can at least partially remedy the situation. By exposing fraud we can seriously discourage new attempts and open the eyes of our more naive colleagues. And, many here will have to agree: it is always fun to effectively dissect a good fraud and watch the maker coming up with the most uncanny explanations. I agree with Mr. M that pleading ignorance (or arguing that “everyone does it”) can only go so far when taking another’s ideas without giving credit. Janet Byron Anderson speaks to one of the larger questions here: what is an original idea? No idea is truly new in every aspect, so where should one draw the line when acknowledging influences? Yes, that journal issue is not in SCIndeks yet, their latest issue listed there is Vol 17 issue 3. This is from Vol 17 issue 4. All of the above retraction notices are pretty explicit. But what happens to the original article later is a different story. It is less than acceptable to use descriptors such as “tsunamy” or “shocking number” in commenting the CEON/CEES’s findings. The “whopping 11% ” of plagiarized articles include large portion of those classified as mild self-plagiarism. The criteria used are all but intended to produce results for cross-national/cultural comparisons. As to the lack of retractions, the author is generally right, but missed to note that the process of official verification of detected plagiarisms is still on. One can see from an announcement at CEON/CEES’s website that this process is slow indeed, that some players are trying to sabotage it, but we have no other option but to give it a chance. Only after that, retractions in journals and consequently in SCIndeks database might take the place. When you shoot the flying duck, you look at your result when it is grounded. I agree with Pero Šipka – the word “tsunamy” in this particular case is inapppropriate. But, yes, there are several cases of plagiarism detected lately in Serbia. The editors of the journals who detected these highly undesirable events should be praised for the steps they took to punish the wrongdoers; their failure is they did not retracted the plagiarized articles properly. However, until recently, such plagiators were neither detected nor punished – therefore, Epur si muove! Yes, I also agree with Gisele Schoene – in the past, very few researches in Serbia have taken the course on science ethics. The situation has changed in the last twelve years: I personally am teaching the science ethics to PhD students in several medical faculties in Serbia, and I am glad to see that my students expressed strong negative attitude to any kind of fraud including plagiarism (see Vučković-Dekić et al. Journal of BUON 2011; 16:771-777).